Click on the image or below to download your Module 5 workbook! There are two important lists that you should know of when it comes to fruits and vegetables. These lists are adjusted every year and are created by the Environmental Working Group (which is where these lists are from) and talk about pesticides in fruits and veggies. *Some of these grown in the US might be from genetically modified crops. Always stick to organic! However, whenever you CAN buy local and organic, or even grow your own vegetables, that's the best! Some farmers may not be certified organic, because getting a label can be expensive for a small farmer. So when you go to the farmers' market, start a conversation with them! Ask them where their farm is, how they grow their food, if they use pesticides etc. This will give you a feeling of knowing who grows your food and might even taste better than certified organic that is wrapped in plastic from your supermarket. Remember: it's all about finding balance and doing what FEELS good in your heart! Let's face it: Lots of people struggle with eating at some point in their life. Be it wanting to lose weight, having less belly fat, or stopping with all the sugar and chocolate cravings. The truth is that we often setup our own rules of what we can and cannot eat. And rules creates restrictions. And restrictions usually don't work and are hard to stick to, because it almost feels like a punishment. So in order to let go of these restrictions, which really usually make us feel worse, we need to stop eating for a certain number on the scale or a certain body shape, and start eating for our health. And that automatically circles back to self-love and honouring your body, which I like to call a temple! Everything we have in our life is temporary: objects, people, housing, cars, phones, jobs. It's all temporary and replaceable. Our body is not. We only have one and when we mess with it, it's going to have consequences. Now this doesn't mean that you're going to be perfect, but it's about creating eating and lifestyle habits that prioritise your health above anything else. So it's about changing our mindset around food and see it as something vital that nourishes our health and our longevity. Breathing before you start eating. Get present. Being aware of what you're putting in your body. What foods are you eating? Enjoying every bite of your food. How does it taste? What flavors are in there? Being grateful for the food that is on your plate - we shouldn't take this for granted! Being present. Don't think about tomorrow, your next meeting or what stressed you out yesterday. Be in the now. It also means to be quiet. Eat slowly. Your body will then tell you when you're full. And when you're full, stop eating. Challenge yourself today to eat mindfully. Prepare a healthy meal, leave your phone or the magazine far away. If you're sharing your meal with someone, make it a goal that you both don't speak for at least 10 minutes and that you just enjoy the food and be present with each other. This is a beautiful mindfulness practice and will teach you a lot about yourself and about how you can become even better at being present in the NOW! Should you be facing any difficulties with foods, such as allergies or intolerances, regular bloating, digestion issues, regular headaches or other pains, as well as skin issues, try an elimination diet and see what happens. An elimination diet works like this: You take out (=eliminate) one food category for about three weeks and see how your body and health reacts to it. Typical things to eliminate for your diet for a certain period are gluten, dairy, sugar, coffee, nuts etc. If you see positive changes in your health, sleep, and/or digestion, this food might not work well for you at this time of your life (this can change again!) and you might want to continue without that food. If you don't notice any changes, you can add it back in and continue eliminating another category. It doesn't mean that you will forever stay away from one category, but you will be more conscious about what's going on and eat less of it, because you will know that it will make you feel bad, give you a headache, bloated etc. We've talked about the chakras a lot in previous modules. 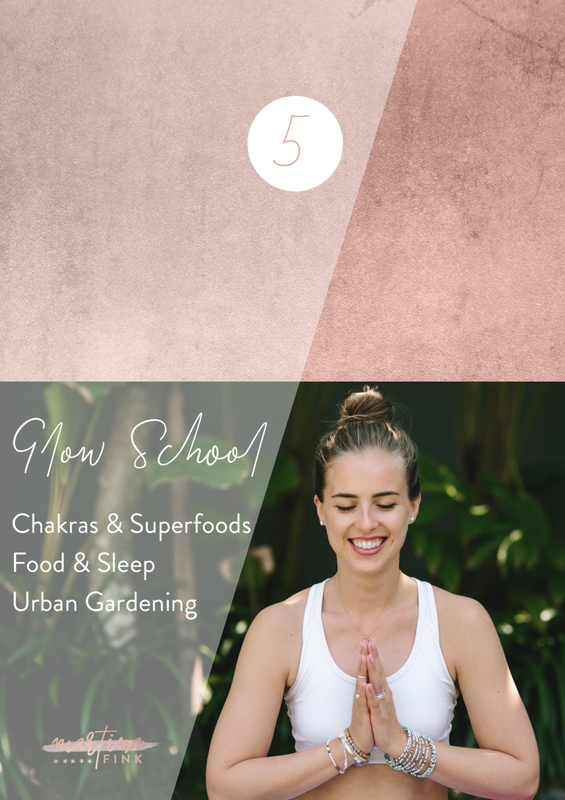 In this lesson, I want you to understand how certain foods affect certain areas and vibrations of our body and energy and which foods are great for which chakra and why. Anything red is really great for the root. Remember that the root chakra stands for feeling safe and protected and stable. That's also why root vegetables are great to give you stability (and they don't have to be red). They grow, root deep and can then rise up into the air. The sacra chakra is all about emotions, creativity, and building a solid self-worth. Orange foods such as oranges, carrots, papaya, sweet potatoes etc. are great to strengthen this chakra and give you more energy in this part of your body. The solar plexus is all about shining your light, being motivated, and standing in your power. So no wonder this chakra is yellow (just like the sun!) and yellow fruits such as pineapple and lemons, are great for this chakra. Ginger is good, too, and cinnamon as well. This is an important one - anything green is great for our heart and for love. Funny enough that this chakra is connected to our lungs, and that the lungs of the planet are the trees, which are green, too. I just LOVE this stuff! Make sure you have something green in your diet every single day, it's highly alkalising, anti-inflammatory and anti-aging! The throat chakra needs some warmth and liquids to wash away the blockages. Stews, warm soups, and teas are great for this chakra. Especially sea vegetables are helpful as well, such as algae, chlorella, spirulina, nori, which also grow in water, which I find quite interesting. This chakra is all about dark blue foods, such as eggplant, blackberries, blueberries, grapes and dates. It helps us get clarity and feel connected with our intuition. There are not many purple foods, I only know of purple potatoes, which are good for the crown for sure. Otherwise, it's just a combination of all the chakra food energies that will bring your crown in flow. Before I make a dish, a smoothie or a juice, I usually ask myself: How am I feeling right now? Do I need more grounding foods (e.g. root veggies), or is my body craving greens? I then prepare something that is aligned with how I feel. Trust and know that your intuition always knows what's best for your body right now. And the more you practice this, the better you will get at it and the stronger your intuition will become! Cacao is the raw form of chocolate, made of the cacao bean. It’s full of antioxidants, more than any other food, and therefore prevents aging and diseases. It gives your skin a super glow, too! Prepare a delicious hot chocolate with cacao powder and coconut or almond milk, or add a spoon to your smoothie. Cacao nibs, which are basically just pieces of a cacao bean, are a yummy snack, too, and look and taste great as a topping of your smoothie bowl! Chia seeds are a gift from the Andes! Chia seems to be the plant with the highest amount of omega 3 on this planet. Together with omega 6, these fatty acids support the natural functions of the body as well as the nerves and the brain. Their antioxidant properties also protect the cells from free radicals, which prevents premature aging and promotes firm skin. Important to know: In order for the body to benefit from the omega 3, the chia seeds need to be ground, so it's better to add it to the smoothie. A chia pudding has lots of vital minerals, too, but the body can't process the omega 3 in that form. A wonder of nature! Coconut oil can be used for cooking, as it does not oxidize when heated like olive oil does (don’t heat olive oil, as it can be carcinogenic). Vitamins A, D, E and K are fat-soluble vitamins and can only be absorbed by the body in combination with fats, so I always add a spoon of coconut oil to my smoothies. Coconut oil is also a great makeup remover, and it gives you smooth skin. Greens are extremely important for a healthy functioning body. Besides all the vital vitamins and minerals they contain, they are full of chlorophyll, which is highly alkalising, which means that it has a high pH level and therefore keeps our body alkaline, which prevents and balances out acidity in our bodies. I love everything from spinach (fave smoothie ingredient!) to salads to broccoli to my beloved Swiss Chard, which I grow myself and has fed me over the entire summer! Lemons spread so much vitality with their intense yellow color (remember solar plexus anyone??). I usually squeeze 1 whole lemon and drink it with a liter of water. Why? Because it’s alkalizing. Here’s what it means: our body has a pH level of about 7.4pH. Stress, junk food, sugar, excessive sports create acidity in the body. Lemons are not acidic. They actually clear acidity, regulating the natural pH level. Get hydrated skin, too! I love nut butters so much, because they're very filling, add a nutty taste to smoothies, sauces, and even salad dressings, and have proteins, too. I discovered these mushrooms about two years ago in a beautiful yoga retreat in the Swiss mountains. It's basically a powder you can add to your smoothie or hot chocolate. These medicinal mushrooms are amongst the highest anti-oxidant plants and have incredible health benefits. They're being used to prevent lots of diseases and are highly potent in their effects. Reishi is more a yin energy type of plant (calming), while chaga has more yang energy and is more vital and energizing. Spirulina is a blue-green algae that grows in freshwater. It is very high in protein, which is essential for weight loss, as it stimulates the metabolism. A food expert once told me: to produce 10 grams of protein from meat, it takes 1300 liters of water. For 10 gram of protein from spirulina, it only takes 20 liters. Amazingly ecological and also great for clear skin. Add a teaspoon to your green smoothie to add more greens and proteins to your diet. A juice is basically the juice of expressed vegetables and fruits, while a smoothie is all of it just blended. There are health benefits to both of them and I think it's important to vary between the two. Since juices have almost no fibre, the nutrients can be absorbed by the body easily and can go straight into our blood. Smoothies are full of fibre, which is important for gut health and for our digestion. Also, a smoothie full of superfoods, vegetables, and fruits can even replace a meal and can be very filling for a few hours. That's why they are good afternoon snacks and are great for people who don't like to eat a full breakfast. Always make sure that at least 1/3 of your smoothie or juice is vegetables, as fruit smoothies and juices are very high in fructose (= fruit sugar) and have similar effects on our blood sugar as white sugar. So yes, smoothies and juices are very healthy, as long as we keep them low in sugar and add in lots of vegetables! Blend it all well. If you want to make a smoothie bowl instead, just add less liquid and use frozen banana slices. This will make your smoothie thicker and can handle the decoration better! ... really anything that makes it look colorful and fun! Let it simmer for about 10-15 minutes until it gets creamy and soft. Use any superfoods for decoration / topping and add a bit more cinnamon on top! You can really make this recipe with all kinds of fruits, add in banana, warm up some berries for your topping etc. I love warm breakfasts, especially in fall, as I feel they are really great for my digestion to start the day well! Get creative with these superfoods and try new things every day! Making your own oat milk is super easy! Plus you can use local oats, which reduces your carbon footprint! Take 1 cup of oats and blend it with 4 cups of water. Take a cheese cloth or a nut milk bag (if you don't have any, you may also use a clean sock to start with!) and strain the mixture. Your milk is ready! You can now enjoy it, refrigerate it for your smoothies and bowls for the next days, OR blend it with 2-3 dates, with a tsp of cacao and a pinch of salt, or with turmeric and pepper to make a golden milk. Keeps for about 3-4 days. Nut milk is as easy as oat milk. The only difference is that you need to soak the nuts for at least 4 hours in advance. You can also do this overnight and make the milk in the morning. Since almonds, cashews don't grow in central / Northern Europe, it is no longer an option for me at the moment. Also, almonds grown in California have been criticized because they transport whole bee populations across the state to make the plantations work, which is not at the highest purpose of nature's laws. I therefore prefer our local Swiss oats that I use for my milk. However, nut milks have a different taste and are definitely delicious! Just make sure you find nuts that are produced in a sustainable and ethical way. Prepare just like the oat milk! Besides buying your fresh veggies and seasonal fruits from the local farmer's market, growing your own vegetables is the most sustainable way to get fresh stuff into your diet! Plus it's also AMAZING for your root chakra, as you get to work with the earth, with soil, which has huge grounding benefits! If you don't have a lot of space, start with herbs. Basil, parsley, sage, chives, rosemary, thyme, marjoram are great herbs to start. I had a really successful spring / early summer this year with spinach: I didn't buy any spinach until late summer! Onions are also very easy to grow and all sorts of lettuces grow easily on a small balcony, too! Make sure you give them enough water. No water, no veggies! When you have a garden you need to plan your time better. When you're away for a few days, someone else needs to water your garden. There are certain plants that don't like rain, e.g. tomatoes. They need to be covered by a roof or they will get sick and die. We all know that the moon affects us in some ways. People sometimes can't sleep when it's full moon, others are extremely nervous or forget a lot of things. Plants notice the moon cycle as well. There are certain days of the month where it is best to plant certain categories of plants. Some days are good for root vegetables, others are good for flowers, others are good for leafy vegetables and there are days where you shouldn't plant anything. Just google "lunar calendar garden" (in German: "Aussaatkalender" / "Mondkalender Garten") and you will get a calendar that tells you exactly when to do what. My parents have been gardening like this for their entire life, and the harvests have always been extremely abundant! My parents' garden earlier this year! My first onion harvest this year! When I started gardening a few years ago, I started creating a completely different relationship with the food. I started how much work needs to be put into vegetables, into harvesting, into really caring for your garden. I realized how much love I started putting into gardening and that the food I eventually created with it just tasted so much different! I love to speak about Vitamin L, Vitamin LOVE, that we put in our meals when we cook our own food and stay away from "dead" processed foods. But it starts even earlier. It starts with the people who grow the food. So when you grow it yourself, you know it best! Imagine what kind of energy the foods get that are planted and harvested with huge machines, loaded with chemicals and where the farmer's only goal is to make more money every year with the land he has. And what kind of energy do you think goes into organic vegetables and fruits that are grown by a farmer that cares about the planet, about the environment and about the food that people will eventually eat? I'm sure you agree with me! Remember that EVERYTHING is energy! And we can take it one step further. Organic means that the soil has to be organic, too! Because a farmer may not use chemicals, but if the soil is full of pesticides, herbicides and unhealthy bacteria, this will still go into our food. Therefore, it is crucial that you buy organic soil as well as all organic seeds and plants when you grow your own food. With the food we eat, we can have a huge positive or negative impact on the world and Mother Earth. Processed food is usually packaged, which means it comes in plastic, best case in paper that you can recycle. A lot of the organic produce even comes wrapped in plastic. With your dollars, you vote. You always have a choice and in fact, it is really important to understand that YOU can make a difference on this earth! The meat and dairy industry uses a lot of water to feed the animals and water to grow the food these animals eat. The more meat and dairy you eat, the bigger your carbon footprint will be. But how about coconuts, cacao, quinoa and goji berries that are shipped around the globe to get to where we live? This also has a huge impact. YOU decide what you support and how you take care of Mother Earth in your own personal way. After watching a documentary called "Conspiracy", which I can highly recommend, I realized that the way I eat and live on a daily basis has a much bigger impact on the planet than the planes I take. And that is actually also the reason why I know and believe that a plant based diet is the best diet for our planet and that with that, we can definitely change a LOT to make this world a better place! There is no right or wrong nor am I here to tell you how you should eat and live :) but I'm here to help you raise your awareness around how you live your life today. The best diet for our planet is a plant based diet. A plant based diet not only makes our telomeres longer (=longevity), it is also way more sustainable than any other diet. Once you watch the documentary mentioned above, you will understand this even better, but just as an example: with the same amount of water and land that is used to produce a certain amount of meat, approx. 50x more vegetables could be grown on the same piece of land. Which means that 50x more people could be fed with the same resources. It's interesting that environmental organizations don't talk about this though - you will understand after watching. Locavores are people who only eat local and seasonal food. They don't eat coconuts from Thailand at home, but when they're in Thailand, they eat coconuts everyday just, like me lol ;) Locavores eat what the local community and season has to offer. It doesn't not make sense to me to eat Swiss or French cheese when I'm in Thailand for example, but local fruits make so much sense! I know this sounds like totally logical, but trust me when I say that so many people have no idea what they're putting into their bodies. Eating local food is great for Mother Earth, because it's produced locally, has no far ways to travel, and doesn't have to be harvested days before they're ripe, just to survive the transportation - which means you get more of the vital nutrients the plants have to offer! These two ways of eating make the most sense to me when it comes to sustainability and health. There is no right or wrong, you definitely have to try what works for you and what gives you enough energy to go through your life. IMPORTANT: these are not diets in a sense that you follow certain rules for a certain period of time, but this is a LIFESTYLE! If you've followed me through Vietnam, you may have seen that I had my daily coconut as well as fruits for breakfast with a delicious smoothie bowl. I'm not eating that, because I feel I should eat fruits or my diet tells me to do so, but because it really EXCITES me and gives me so much joy to eat a plate of colorful and vibrant foods! So make your food your lifestyle and you will be able to just boost your health like crazy! Synch your rhythm more with nature's rhythm. Try to get a regular sleep schedule. Try to sleep or at least lay down before 10pm. Track your activities and food after 6pm and observe how you sleep after certain activities. Honor your body. When you feel tired, you should probably sleep! Don't go to bed on a full or empty stomach. Turn off computer, tv, and phone at least an hour before you go to bed. The white light makes your body think it's still day and won't produce melatonin, a hormone that promotes sleep. Make your bedroom a sanctuary and just LOVE your bed! Use lavender shower gels and lotions or essential oils to calm your nervous system. Make sure you get anywhere between 7-9 hours of sleep every night. Watch a documentary about sugar, checkout an incredible subscription service, and get a lexicon for holistic health!